series 1010-Grumbacher Pinstriping Brushes by Mack Brush in 3 sizes. 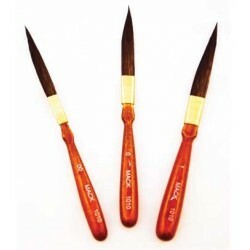 Back by popular demand the series 1010-Grumbacher Pinstriping Brushes reproduced has a brown wood handle made with natural hair wrapped in metal, in sizes 00, 0 and 1, total size of hair and handle is 5". When looking at this brush you'll notice the hair travels out quite abit before the cut and belly, this type of cut is so you can hold the brush more upright like a lettering brush verses the classical way of holding the brush as low as you can. Remember to look at the shaped edge (belly) of the brush your using. More information on series 1010-Grumbacher Pinstriping Brushes listed below. Brush Tips by Ron Percell, how much of the brush touches the surface when using a pinstriping brush?. You can use all of the brush if you want to, and lay it sideways to fill in designs. Now if you want to do it correctly, look at the belly of the pinstriping brush where it's round all the way to the tip. The curved shaped of the brush is the area of the brush that you'll work from, this angle also indicates the angle (tilt) in which you hold the pinstriping brush based on the way the pinstriping brush is design. The rest of the area behind the brush is for the load of paint. Some jobs require more paint, some less, over my career I've thousands of artists and some would pull short lines while others would pull an entire pinstripe in one stroke, it's your choice but I'd learn to pull both type of lines and that why there's so many types of pinstriping brushes.